The Klein Tools Webbed-Polypropylene Adjustable Tool Belt is constructed of heavy-duty 2-Inch W polypropylene webbing and fits waist sizes up to 48-Inches. For more than 160 years, Klein Tools has manufactured premium-quality, professional-grade hand tools that deliver the performance, durability and precision needed to get the job done right. Our family of engineers, workers and craftsman continue to put six generations of expertise into every tool we create by using only the highest quality materials, superior workmanship, and keeping manufacturing as close to home as we can. Klein isn't just the name of our company, it's also our family name. And since we're an American company that's family-owned and family-run, you know you can count on us to be here tomorrow. Klein Tools doesn't just make great products, we make great products that stand up to the demands of the professionals who use them every day ... Since 1857. Adapt easily to any work environment with the Dickies Work Gear 57013 Heavy-Duty Web Work Belt. Constructed of heavy-duty, black nylon webbing it is the perfect belt for adding pouches or single tool holders. 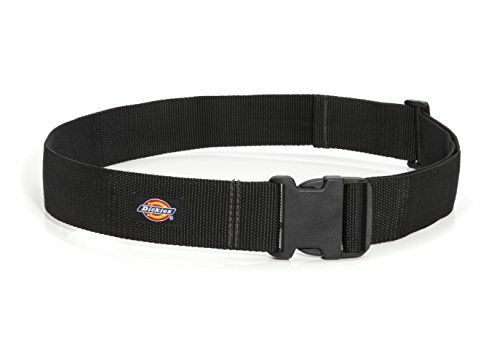 The durable, high-impact plastic buckle provides added strength along with quick release convenience, and the belt adjusts to fit waists from 32 inches to 52 inches. The belt itself has a sturdy 2-inch wide design that, while too large for standard belt loops, will fit most tool and accessory pouches with 2-inch clip-on style belt attachment loops while the oversized buckle will easily slip through 3-inch or wider tunnel loops. With its no-fuss design and signature Dickies quality, this belt is perfect for every job just clip on, adjust, add your pouches, and go! Designed with functionality in mind, every Dickies Tool Bag is crafted of heavy-duty materials and equipped with features to help you work smarter. Each bag, pouch, belt, or rig is built to last. With reinforced pockets and tool loops, durable webbed straps, and an assortment of pockets to store every tool in the garage, these tough bags are meant to hold up to the harshest of environments. Whether you're a painter, carpenter, builder or weekend warrior, there's a Dickies Tool Bag out there made to keep you at the top of your game. Warranty: 1 year Limited Lifetime Warranty. This product is backed by a One (1) Year Limited warranty. This warranty covers manufacturer defects and workmanship. The warranty excludes misuse or abuse and normal wear and tear. Exclusion is not allowed in some states and may not apply. This warranty gives you specific legal rights, and you may have other rights, which vary from state to state. 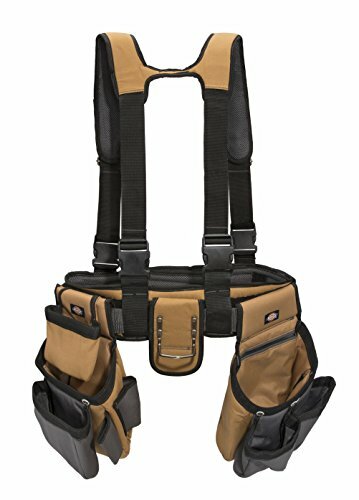 Dickies Work Gear 4-Piece Carpenter's Rig 57023 Tool Belt Suspenders Cooling Mesh Padded Suspenders Steel Buckle Leather Tool Belt Grey/Tan 3.8 lb. For the toughest of jobs, choose the Dickies Work Gear 57023 4-Piece Carpenter s Rig. This tough rig is designed for ultimate performance and convenience. Constructed of heavy-duty canvas, it features comfortably padded gel-core suspenders that help carry heavy loads and distribute weight evenly, causing less strain on your lower back and hips. Fully-adjustable front and back straps let you customize your fit. An elastic-sided cell phone/device pocket is located on the front of the suspenders and has a hook and loop secured flap to keep contents safe. The 5-inch padded waist belt is secured with both a durable steel double-roller buckle and hook and loop on the pad itself and adjusts from 32 to 50 inches in length. Featuring a total of 6 large pockets, 7 smaller pockets, and 2 tool loops spread across its 2 pouches in addition to a convenient steel hammer loop, this rig has everything you need to organize your tools and supplies with ease. Designed with functionality in mind, every Dickies Tool Bag is crafted of heavy-duty materials and equipped with features to help you work smarter. Each bag, pouch, belt, or rig is built to last. With reinforced pockets and tool loops, durable webbed straps, and an assortment of pockets to store every tool in the garage, these tough bags are meant to hold up to the harshest of environments. Whether you're a painter, carpenter, builder or weekend warrior, there's a Dickies Tool Bag out there made to keep you at the top of your game. Keep Small Tools around You No more headaches from losing or dropping screws, nails, bolts, washers, pins, needles, drill bits, fasteners, and small tools. Easy to Carry Can carry a portable toolbox on you and have easy access to all your tools in seconds. 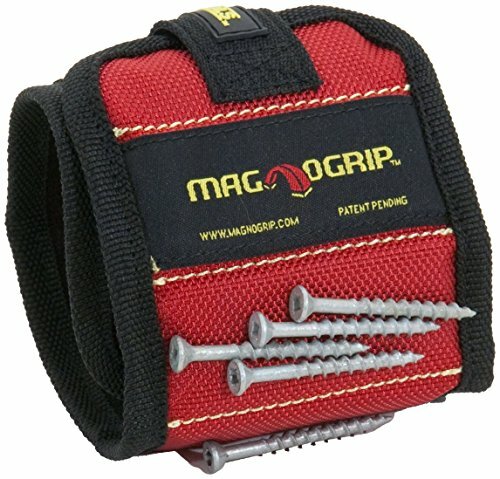 Amzing Capacity This top notch tools holder magnetic wristband features 15 powerful magnets that can securely hold 144 half inch nails, or 68 two inch nails, or 100 medium wood screws even 50 large wood screws. Fit More Cases Magnetic Wristband, can be adjusted to fit any wrist, unisex design that will suit both men and women. One-size-fits-most professional grade piece of equipment that will make the jobs you have to get done. Ideal as DIY Tool Whether you've been tasked with an important construction project, a DIY home improvement job, or a simple fix-it project around the house, it is the perfect third helping hand to complement your hard working style. Package Included 1 x Magnetic Wristband 1 x Instruction Manual Warranty 18-month warranty. Any questions you have, please don't hesitate to contact us. We will get you back within 24 hours. EVER TROUBLED BY MESSY SCREWS, NUTS? Yes, really frustrating. Now our magnetic wristband can reach out. 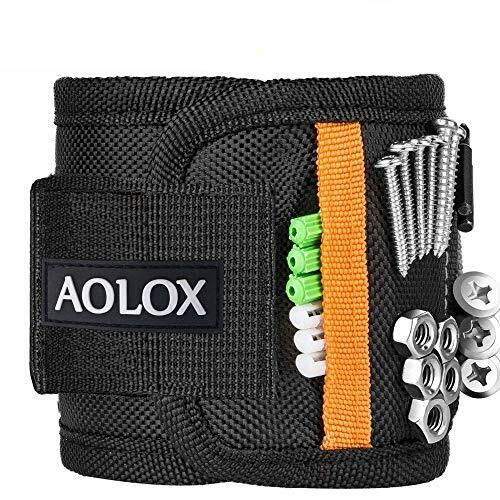 Simple put this magnetic wristband on and keep your screws, nuts, drill bits, bolts, nails and washers neatly stored on it and pick what you need without moving an inch! DOES IT SUIT MY FATHER'S ELECTRONICS REPAIR AND MOTHER'S NEEDLEWORK ? Yes it definitely suits. 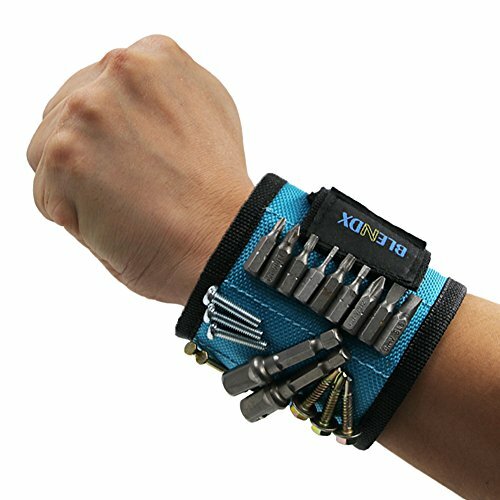 It is embedded with 15 super strong magnets, surround almost entire wrist, perfect for holding nails, drill bits, fasteners, wrenches and tailoring \ sewing small tools. IS IT ADJUSTABLE AND COMFORTABLE? Exactly correct. Made of 100% 168D ballistic Polyester, velcro strap up to 13.2 cm, this Magnetic Wristband is easy for your any adjustments. Lightweight design and breathable material make this magnet wrist screw holder perfect for you! 74052 Features: -Work belt. -Material: Heavy top grain oiled leather. -Heavy duty double pronged metal roller buckle. -Rivets with caps for safety. Product Type: -Wrist Support. Generic Dimensions: -52'' H x 2'' W x 1'' D. Dimensions: Overall Product Weight: -0.6 Pounds. X Style - Designed to distribute weight of duty belt over shoulders, taking weight off hips and lower back. Neoprene Pad - Improve comfort of wearing even under considerable load. This contractor-grade construction work apron in suede leather has a 2-inch wide web belt with an interlocking buckle and 4 main pockets with 8 smaller pockets and sleeves and 2 hammer loops. HEAVY DUTY WORK APRON: This Custom Leathercraft work apron is made of heavy-duty contractor grade suede leather with wide double front pockets for easy access. 12 POCKET WORK APRON: This CLC tool apron features 4 main nail and tool pockets and 8 smaller pockets for nail sets, pencils, and pliers. POLY WEB BELT: This work apron comes with a 2-Inch Poly web belt with metal interlocking buckle. LEATHER COMBINATION SQUARE HOLDER: This CLC work apron features a leather combination square holder. Magnelex - Magnetic Wristband. 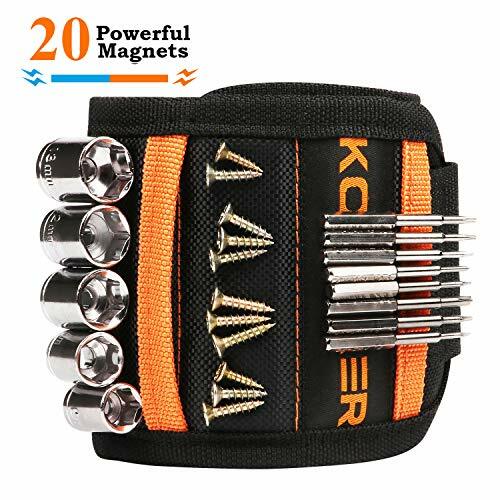 Nine strong magnets embedded for holding tools, screws, nails, nuts, washers, bolts, pins, drilling bits, screwdriver bits, fastaners, anchors and any small metallic objects. Adjustable, ergonomically designed, high quality velcro wrist strap. Perfect for home improvement, woodworking, car repairs and do-it yourself projects. Breathable lightweight band design. Time saver. no need to look for small parts. Keeps your hands free while working. Great for working on ladders and tight areas. You won't drop items anymore. One of the best gift ideas for dads, men, friends and family. It is a great stocking stuffer for men. A must have item in your tool bag, tool box, project box. Great gift for christmas, gift for men, gift for him, gift for dad, gift for fathers. It is also a great gift idea for fathers day. 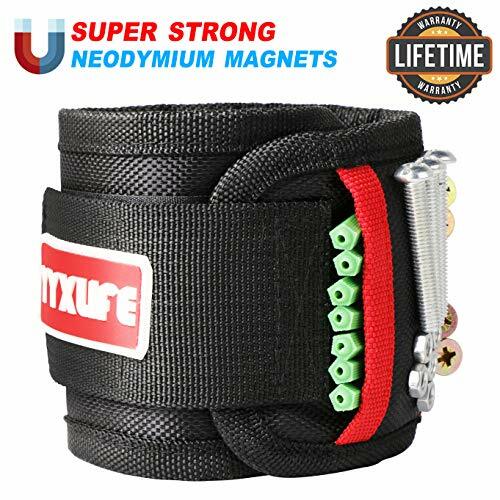 Super strong magnets embedded wristband for holding screws, nails, bolts and small tools. Perfect for home improvement, construction, wood working, carpentry, auto repair projects. Great for working on ladders and tight areas. Keeps your hands free while working. Time saver! no need to look for small parts. Searching for a gift for your father, boyfriend, husband or brother is not an easy task. Magnelex Magnetic Wristband will be a great choice for the great guys in your life. A perfect gift for Men, Fathers, Boyfriend, Husband, DIYer or Handyman. Best Christmas Gift, Fathers Day Gift, Birthday Gift for men, Christmas Stocking Stuffers, Xmas Gifts or great gift idea for any other occasion. Adjustable top quality velcro wrist strap. One size fits most. 100% money back guarantee! Brand: Magnelex | Manufacturer: OZNC Global Ithalat Ihracat Ltd. Sti. 5-in-1 holder provides 5 times the tool capacity in the belt space of one holder. Offers holders for hammer, lumber crayon or screw driver, pliers, pencil, plus it features a Oxy Tool Shield for sharp tools such as chisel or work knife. Designed for professionals and weekend warriors. 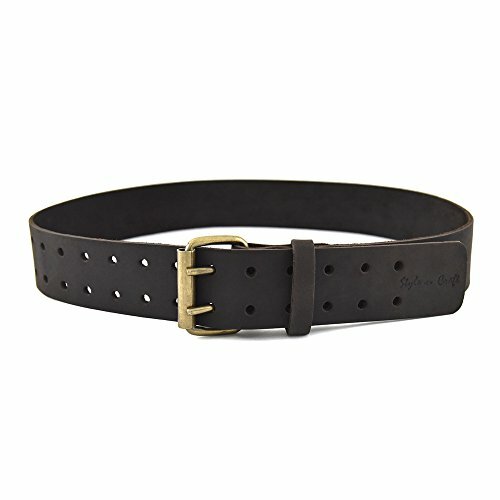 May be worn on any belt up to 3" wide. Sturdy American leather ensures years of endurance in the field. "BLENDX" magnetic wristband features fifteen magnetic discs to give you quick and easy access to small metal parts like screws, nuts, bolts and bits! No more digging around for parts in your pockets. The one-size-fits-all magnetic wristband fastens with an adjustable strap and loop closure. 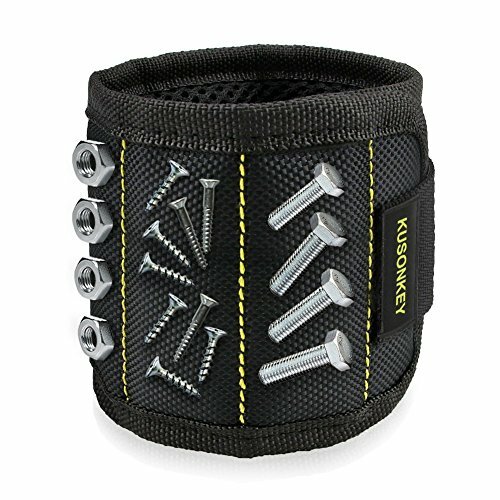 Recommended Use: The magnetic wristband is designed for holding small items such as nails, screws, drill bits, nuts, bolts and fasteners. Warning: Keep away from pacemakers and other magnetic sensitive devices. 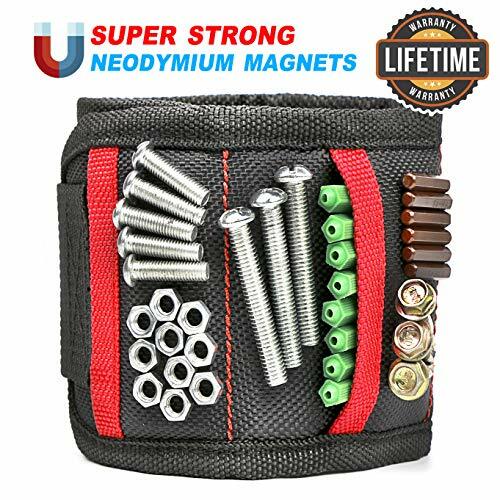 15 STRONG MAGNETS: Embedded with " 15 " super strong magnets, surround almost entire wrist, perfect for holding nails, drill bits, fasteners, wrenches and small tools. 100% Money Back Guarantee! worry free return or replacement warranty just for your 100 % satisfaction. Wilmar W1265 Large Magnetic Nut And Bolt Tray keeps small metal parts and tools from getting lost with its two strong double magnets and stainless steel construction. Even works sideways and upside down! 9-1/2-Inch by 5-1/2-Inch. Apron has large, gusset style pockets, 9 main pockets with 11 smaller pockets and sleeves, zippered pocket to secure valuables, carabineer for keys or lanyard. Pouch handle allows for simple belt adjustments and easy one hand carrying. Fully adjustable, padded yoke style suspenders with Dri-Lex for added comfort, includes extra pocket and neoprene padded cell phone holder, 5" padded belt with Dri-Lex and double tongue roller buckle for added comfort and better belt stability. 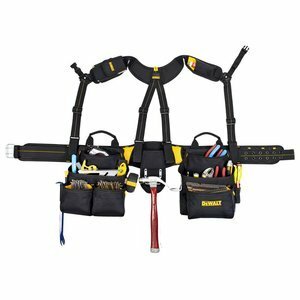 Adjustable work apron: this DeWalt framer's Combo apron with Suspenders has fully-adjustable padded Suspenders to help distribute weight evenly. 20 pocket work apron: this DeWalt combo apron has 20 pockets and sleeves for nails, Parts, tools, nail sets, pencils, etc. Comfortable work apron: The padded belt with double-tongue roller buckle on this work apron provides extra comfort and helps keep belt stable. Hooking up our Padded Tool Belt Suspenders to your work belt or tool rig is the easiest way to stay comfortable all day long! Our tool belt suspenders are 100% PUNCTURE RESISTANT BALLISTIC NYLON and have NICKEL PLATED HARDWARE including SPRING-LOADED CLIPS which makes them LIGHTWEIGHT and COMFORTABLE while remaining STRONG and DURABLE! Whether you are a CARPENTER, ELECTRICIAN, FRAMER, PLUMBER, CONTRACTOR, CONSTRUCTION WORKER, HANDYMAN, TACTICAL, or in LAW ENFORCEMENT, we have you covered for years to come. 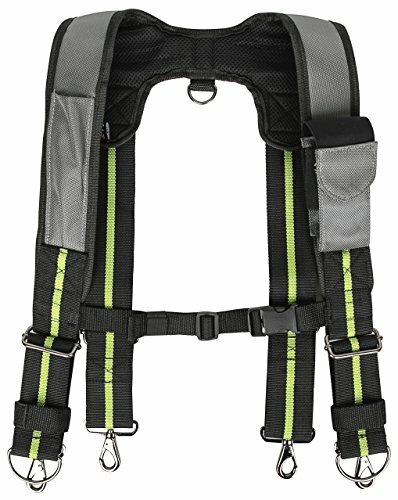 Our Speed Square Tools Padded Tool Belt Suspenders are BUILT TOUGH to LAST LONG . Perfect as a reward for the efforts of your crew or as a gift or stocking stuffer for the hard worker in your life. Generously Padded Straps and Ergonomic Design Backed by our 100% Money Back Guarantee! Proudly made with high quality materials and attention to detail Commercial Grade and suitable for both Work and Home AMAZON PRIME eligible shipping means you will have them ASAP! Click the Add to Cart Button NOW and we will ship them to you RIGHT AWAY! QUICK ACCESS TO EVERYTHING - Chest access to Built-in Large Phone Case and Carpenter's Pencil/Marker Pocket. Phone Case large enough for iPhone 8/X or Samsung S9 with Otterbox Defender. High quality velcro to make sure your phone stays in place. 100% MONEY BACK GUARANTEE - Our customers are #1. If you are not 100% satisfied with your purchase, return it for a full refund with no questions asked! COMMERCIAL GRADE & UNIVERSAL FIT - Will fit any work belt or tool rig with ease! Great for use by CARPENTER, ELECTRICIAN, FRAMER, PLUMBER, CONTRACTOR, CONSTRUCTION, HANDYMAN, TACTICAL, LAW ENFORCEMENT. Handy back-mounted D-Ring for rig hanging storage during break or at the end of the day. Still hold nails or screws in your mouth or pocket when you try to fix something on a ladder? All you need is only a simply magnetic wristband! You will NEVER bear looking for a nail on the ground, or have to put the dirty nails in your mouth either! Why choice us? Super Strong Magnetic: Our magnetic tool wristband equipped with 20 super powerful magnets, making it more powerful than the similar products on the market. Easily holding all your necessary metal tools stay there even if you shaking your arm try to get them off. Breathable & Lightweight: Made of durable 1680D ballistic polyester and with soft padded mesh design to ensure lightweight and breathable. One Size Fits Most: Adjustable velcro wrist strap to fit most wrists. Great Time Saver: No more headaches from losing or dropping small items while working, the megnetic wristband provides a third helping hand when you need it most. 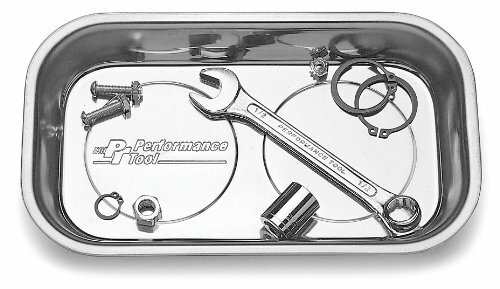 A Must Have Gadget in Your Tool Bag: Unique gift for Birthdays, Christmas, and other Holidays for any DIY, car & motorcycle Enthusiasts, electricians, roofers, carpenters, contruction workers, handyman, father, boyfriend, men, or women! Specification: Material: 1680D Ballistic Polyester Color: Black&Orange Size: 40*9CM (16in*3.5in) Note: Please allow 1-2cm error due to manual measurement. Please make sure you do not mind before you bid. SPECIAL MAGNETIC- Our magnetic wristband embedded 20 SUPER STRONG MAGNETS with permanent powerful magnetic force and larger contact area, making it more powerful than the similar products on the market, can easily holding screws, nails, bolts, washers, drill bits. No more headaches from losing or dropping small items while working. BREATHABLE & LIGHTWEIGHT- Made of 100% 1680D ballistic polyester and soft padded mesh design to ensure lightweight and breathable. Perfect for home improvement, woodworking, construction, carpentry, auto repair, sewing, and other DIY projects. ONE SIZE FITS MOST- Adjustable velcro wrist strap,can be adjusted to fit any wrist, unisex design that will suit both men and women. TIME SAVER AND PROVIDES A THIRD HELPING HAND-Whether you've been tasked with an important construction project, a DIY home improvement job, or a simple fix-it project around the house, it is the perfect third helping hand to complement your hard working style. PERFECT GIFTS- DIY'rs, car & motorcycle enthusiasts, electricians, roofers, carpenters, contruction workers, handyman, father, boyfriend, men, or women. You won't know you need magnetic wristbands until you have one! Especially if they make work easier and more fun! This is the perfect answer for those who like to do their own home improvements or work in construction. This ANART wraps perfectly around your wrist and hold your nails, screws and bolts and helps to keep you from having to climb up and down a later or hold them in your mouth or even in your pockets. Made with strong, durable and breathable fabric to be used under any work environment.The magnets are super strong! The nails and screws won't come off unless you pull it off. At the same time it is easy to pull off one at a time by hand. A fabulous Father's Day gift for most any dad, grandpas. Or a great birthday gift or Christmas gift as well. Would even be a good gift for moms, especially ones that do crafts, the Velcro allows it to fit a variety of sizes. The band can hold a massive amount of screws and nails, they will not fall off the band even if you try to shake them off. It can also hold a hammer and handful of nails or screws at the same time. This works great when holding 2 large tool with screws and nails alongside it. GUARANTEED SATISFACTION: You have a full year to return your magnetic wristbands if it does not meet your expectations! The perfect tool for your next DIY project. Get the helping hand that you deserve with the Magnetic Wristband by BEST EVER Pro. Our Magnetic Wristbands are one size fits most using strong adjustable fasteners. The outer layer is made of durable ballistic polyester to stand up to tough conditions. The inner layer is made of soft breathable padded mesh for all day comfort. Rely on our 10 powerful magnets to attach needed tools and items nearby for quick and easy access. Save time and free yourself from the frustration of dropping or losing your items. Not everything can attach to magnets . Take advantage of the 2 pockets to store non-metal items as well. Our wristbands are designed to be versatile, keeping up with all the needs of your projects. Be the perfect gift buyer . Whoever receives this Magnetic Wristband will be ecstatic and thank you for its convenience and versatility. Have the best ever tool for your next DIY project! Click Add to Cart right now and order yours today! 10 EXTRA STRONG MAGNETS embedded for holding screws, nails, drill bits. Excellent for home improvement, construction, woodworking, auto maintenance, sewing/crafting, and other DIY projects. 2 CONVENIENT POCKETS for holding non-metal objects. Great for holding plastic wall anchors, zip ties, and wire connectors. RELIABLE HELPING HAND when needed most. Save time by not dropping or losing items. BEST UNIQUE GIFT IDEA for guys, boyfriend, husbands, or women for birthdays, Christmas, Valentine's Day, or any other holiday. SATISFACTION GUARANTEE - We pride ourselves in every product made, if you are not completely satisfied, we're happy to give you a refund. No questions asked. Searching the gift guide after cool gadgets for men? best tech gifts? gift for guy friend? Try this men tool gift! As birthday gift for men, husband gifts from wife, dad birthday gift ideas, dad gifts from daughter / son (top gift for dad / husband), anniversary gifts for husband / boyfriend, this inexpensive gifts for men will work! Securely hold nails, bolts, drill bits, pins and small metal parts where you need them most! 1. Our wrist magnets are one size fits all. 2 pack of different type magnetic wristband tools 6 magnet and 10 magnet. 2. This magnetic tool wristband is embedded with powerful magnets, which can attract needed tools and objects quickly to save time. 3. The magnetic wristband can be applied to home improvement, construsction, sewing, screwing and so on. 4. 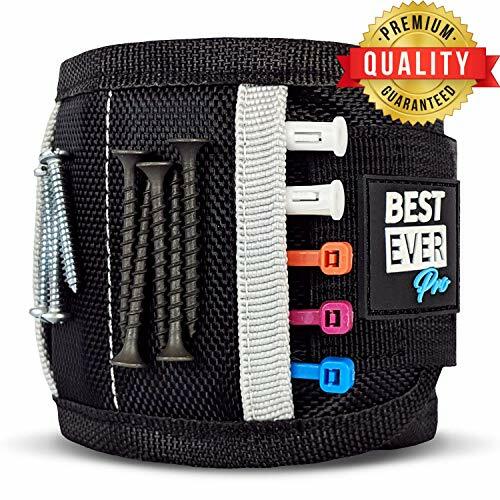 Please notice that this magnetic tool belt can attach everything attched to magnets, not everything can attach to wristbands. 5. The magnetic wristband is perfect gift to all because it's versatile. Whoever receive it will be really satisfied. HIGH QUALITY: This magnetic wristband is made of durable polyester, along with breathable mesh inner layer. The comfortable design allows maximum breathable for the whole working day. 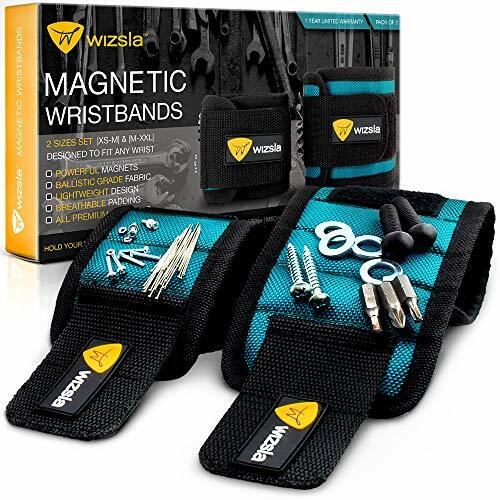 PERFECT PACKAGE: 2 Pack of different type magnetic wristband tools (6 magnets & 10 magnets) satisfy all your want when you need to hold screws, nails, metal tools and more. MULTIPLE USAGE: Our wrist magnets is ideal use for holding screws, nails, bolts, drill bits. And it s perfect to apply to home improvement, construction, auto repair, sewing and other DIY projects. STRONG MAGNETS: Strong magnets embedded in magnetic tool wristband surround. This whole entire magnetic wristband tool can attract about 500g objects at the same time, like screws, nails, bolts, drill bits, and more, which is easy to take a lot of things. INTIMATE SERVICE: Our magnetic wristband for screws are good enough to let you purchase without hesitation, but if you feel dissatisfied after the receipt of the goods, please contact us in time and we will help you to solve it. 100% waterproof lightweight membrane prevents the external water molecules from entering the socks. Smooth toe seam eliminates bulky seams to greatly help prevent bruising and pain from running. RANDY SUN waterproof hiking socks fit comfortably with any trail running shoes, hiking boots, ski boots or other sports sneakers. match your hiking shorts, workout pants, fishing rod, ski jacket, or other hiking gears. which is mixed with nanocomposites to change fiber's cross section and make it produce many fine grooves. It ensures an unparalleled feeling of cool and dry comfort and prevents any stickiness. If you are not happy with your socks, feel free to return them for a full and prompt refund. If you have questions about our waterproof socks, we would love to hear from you. WATERPROOF & BREATHABLE: 100% waterproof lightweight membrane prevents the external water molecules from entering the socks. RANDY SUN waterproof socks are designed with breathable Porelle membrane and COOLMAX fabric to wick sweat away from your skin, thus keeping feet cool and dry during sports and exercise. PERFORMANCE COMFORT FIT: Smooth toe seam eliminates bulky seams to reduce abrasion and provide extra blister protection. Deep heel cup style with full wrap prevents your socks slipping into boots or shoes.Ultra-light cushion sole provides comfort and great fit. Non slip ribbed top keeps the sock stay in place. OCCASION: Made of 100% high-tech material, the seamless, moisture-wicking socks are not only thermal and windproof, but also wear resistant and lightweight. 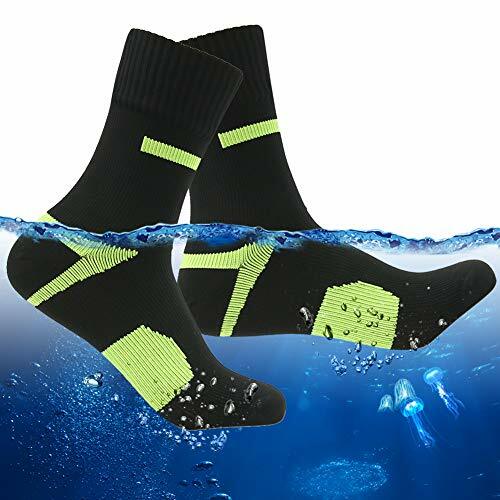 These waterproof socks are especially applicable for hiking, backpacking, trekking, camping, trail running, fishing, mountain biking, hunting, skiing, snowboard and other outdoor sports and activities, even in various harsh environments. Best Birthday/ Anniversary gifts for your friends and family. WASH & CARE: Machine Wash and the water temperature should be below 40 C/ 104 F; Hand wash under normal temperature.Tumble dry below 60 C/ 140 F. Do not iron or dry clean. No distortion or color fading after multiple washings. Let you say goodbye to the troubles caused by the loss or drop of screws, nails, bolts, washers, pins, needles, drill bits, fasteners and gadgets. The exterior is made of high-quality nylon and the interior is double-layered with a soft mesh for maximum breathability for maximum comfort and safety. Whether you are responsible for construction projects, DIY home improvement work, or simple repair projects, it is the perfect third-hand help. Portable tools are easy to carry around, and it's easy to absorb the tools and items you need, saving time and increasing efficiency. 1. Provide thoughtful gifts for your husband, father, son, boyfriend, man or woman. 2. An extra pack of free multi-functional cable ties, ideal for computer, equipment and electronic cable management and bundling, reusable, detachable design. 1. We are committed to providing our customers with the best shopping experience and a lifetime warranty. 2. If there is any dissatisfaction, please contact us in time, my US after-sales service team is ready to serve you! 3. Add To Cart right away and start your DIY home life. 2019 Latest Upgrade Design This Magnetic Wristband is made of durable 100% nylon with a double layer of soft mesh. Adjustable length, breathable, lightweight and durable, perfect size. Provide the perfect comfort for your wrist. Lightweight & Durable It is easy to carry and easy to use. Suitable for many woodworking, home improvement and DIY projects. It's very easy to help you grab all the small metal objects without worrying about searching for small parts in the toolbox or pocket to improve your productivity. Wide Range of Uses Super magnet, covering almost the entire wrist, with two small pockets and plastic parts. Suitable for fixing nails, drills, fasteners, hairpins, bolts, washers, pins, wrenches and gadgets, etc. Unique Gift perfect home decor and toolbox accessories. The unique Christmas gift tool is perfect for husbands, fathers, boyfriends, men, roofers, buildings, mechanics and anyone else. Lifetime Warranty We are committed to providing a lifetime warranty and a 60 day money back guarantee for this magnet wristband. If you are not satisfied, please contact us immediately and we will refund or replace the new one. No risk to buy! Can carry a portable toolbox on you and have easy access to all your tools in seconds. 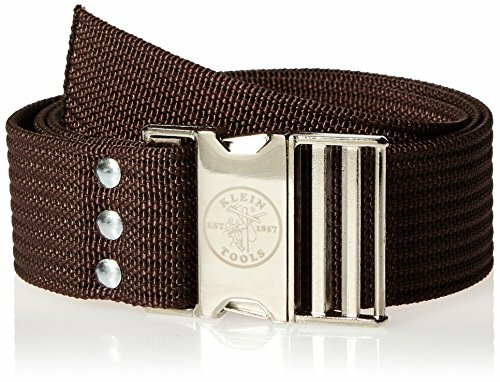 Increase elastic elastic band on the inside of the product, unique product design, the details of the deal are reflected in fashion and quality of the perfect combination. For the handyman home repairmen, wood workers, carpenters, auto mechanics, plumbers, and general contractors, man and woman, for all occasion! Ideal for gripping nails, bolts, screws, and smaller tools, screws, nails, bolts, washers, drill bits. Won't fall off the wristband unless you take them off. Keep away from pacemakers and other magnetic sensitive devices. PERFECT DIY PRODUCT: great for home projects, handyman, holiday and birthday gift, working on car, outside projects and more! 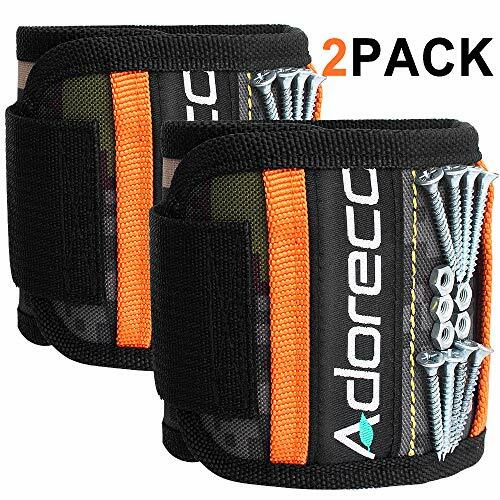 ONE SIZE FITS ALL: 2 pack wrist bands, can be adjusted to fit any wrist, keeps your hands free while working. 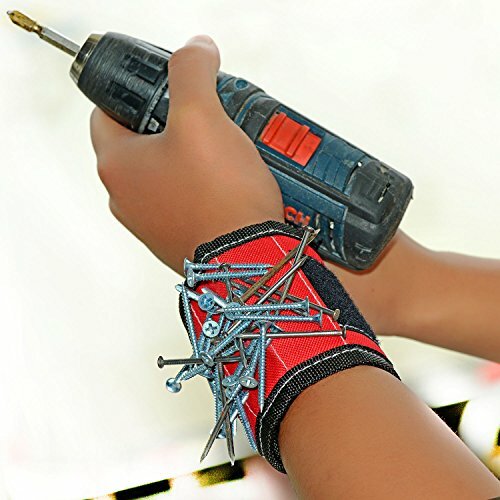 Magnetic wristband is perfect tool for your next DIY project. it's a precious present for your friends and your families. Made of 100% 1680D ballistic Polyester Magnetic Wristband is Embedded with 10 Large magnets, With two small pockets, plastic parts are placed. Magnetic wristband with 2 storage bags and strong magnetic, it is suitable for carrying products, it has an elastic band which can adjust the size to fit for many wrists and can make sure that the wristband doesn't fall off,you can feel very comfortable and convenient. 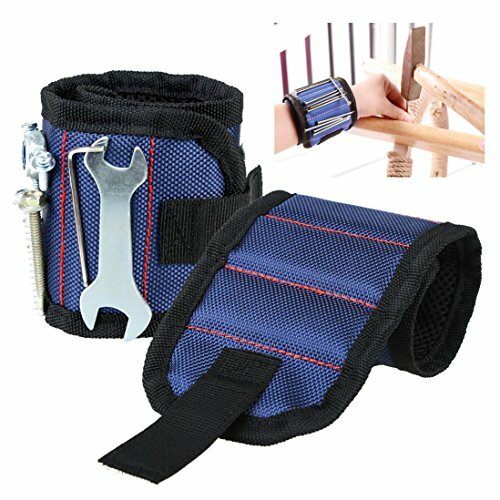 Magnetic wristband for holding tools suitable for holding screws, nails, bolts, and some other products, which can bring convenience to workers and handymen, a tool fits for home improvement, auto repair, sewing, mobile phone, computer maintenance and other DIY projects, unisex design that will suit for both men and women. If there is any dissatisfaction, please contact us in time, my US after-sales service team is ready to serve you! High-Quality Magnetic Wristband Embedded "10" super magnet, magnetic wristband around almost the entire wrist, with two small pockets, plastic parts placed. Ideal for fixing nails, drills, fasteners, hairpins, bolts, washers, pins, wrenches and gadgets, more. Comfortable and Durable The magnetic wristband is made of durable 100% nylon with a breathable mesh inner layer to provide the most comfortable tool for your wrist. The fixed mesh and lightweight design of the magnetic wristband provide maximum comfort throughout the working day. Lightweight and Convenient The magnetic wristband is very suitable for many woodworking, home decoration and DIY projects. Very good helper is like your third hand. The magnetic staple holder is ideal for holding all small metal objects without worrying about searching for small parts in a toolbox or pocket. Unique Gift Magnetic wristband is the perfect home decoration and toolbox accessory. The unique Christmas gift kit is for husbands, fathers, boyfriends, men, roofers, builders, mechanics, and anyone. Lifetime Warranty, Reliable After-sales Service We are very confident about the quality of magnetic wristbands. If you are not satisfied, please contact us immediately and we will refund or replace the new one. Our US after-sales service team is at your service! 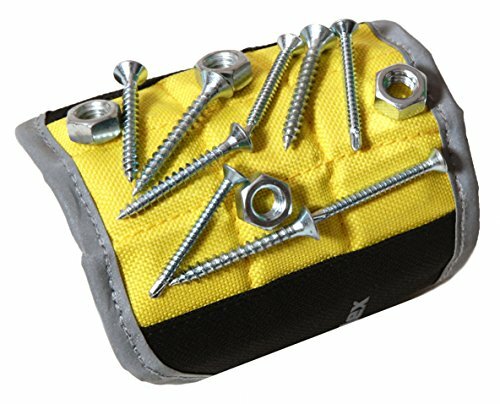 6 strong magnets to help hold screws, nails, scissors, bolts, washers, drill bits. An essential tool for woodworking, construction, home improvement, auto repair, and other DIY projects. Perfect gift for men, father, husband, boyfriend, DIY handyman. One size for all, Velcro can adjust the size of the wristband. Made of Oxford and velcro, very comfortable. 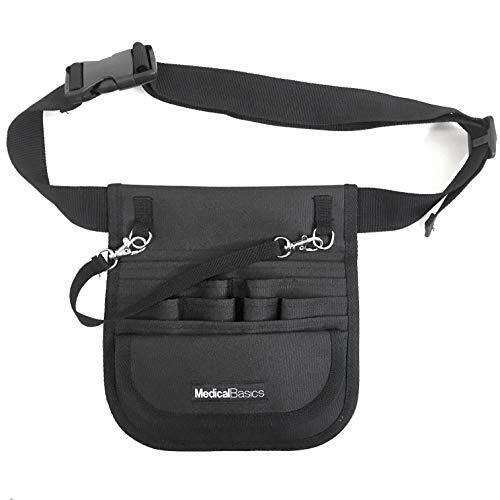 A premium utility belt designed for medical professionals. Premium materials/construction, minimalistic profile and designed for practicality. The only nurse pack one will ever need! Designed by medical professionals, for medical professionals. Lifetime durability guaranteed. Two belt sizes to choose from: 24"-38" or 34"-48"
The perfect organizer for nurses, EMT, CNA, NP, PA, and more! 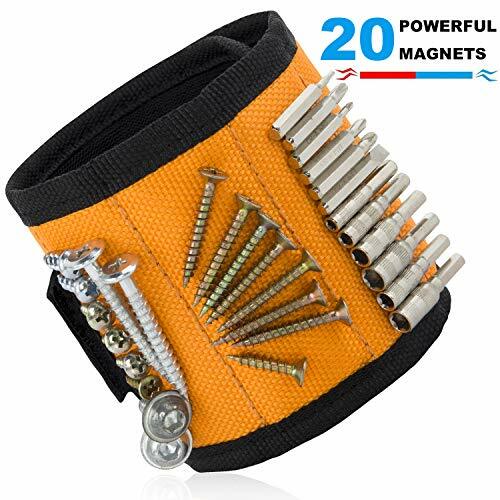 20 Super Strong Magnets Magnetic wristband embed 20 super strong magnets, perfect for holding screws, hammer, and other big or small tools. One Size Fits Most Adjustable Velcro wrist strap fits most men and women's wrist. Perfect for many wood working, home improvement, and DIY projects. Comfort & Breathable & Durable Made of 100% 1680D ballistic polyester, breathable, lightweight, durable and practica. Time Saver Provides a third helping hand when you need it most, no more headaches from losing or dropping small items while working. Perfect Gift Idea Unique Gift for Birthdays Father's Day and other Holidays. 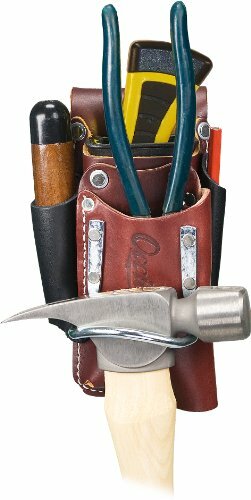 Best Tools for any DIY, handyman, father, boyfriend, men, or women. 1.Any bits or bit-holders that have certain kinds of metal (such as bit extenders with stainless steel amalgams that include nickel) will NOT be as magnetic -- sometimes barely adhering to the wrist band. 2.If working in very tight places, you can try wrapping on the forearm, bicep, or on your belt so it is completely out of the way. You can also lay it out flat on your engine compartment and use it as a magnetic tray. Magnetic Tool Wristband--Magnetic Bracelet embedded with 15 super strong magnets. Magnetic wristband add on magnets and enlarged more areas for holding screws, nails, scissors, small tools, Bolts, bits and more. Perfect for home improvement, construction, wood working, carpentry, auto repair projects. Best Gift--Great time saver by providing a 3rd helping hand when you need it most. No more headaches from losing or dropping small items while working. perfect gift for Birthdays, Christmas, and other Holidays for any DIY, handyman, father, boyfriend, men, or women. Resistant Materials and Lightweight--This magnetic adjustable wrist strap made of 100% 1680D ballistic Ployester, lightweight, breathable and durable, you'll hardly notice you are wearing this Wristband while working. ADJUSTABLE FIT ONE SIZE--This Magnetic Wristband is easy for your any adjustments. 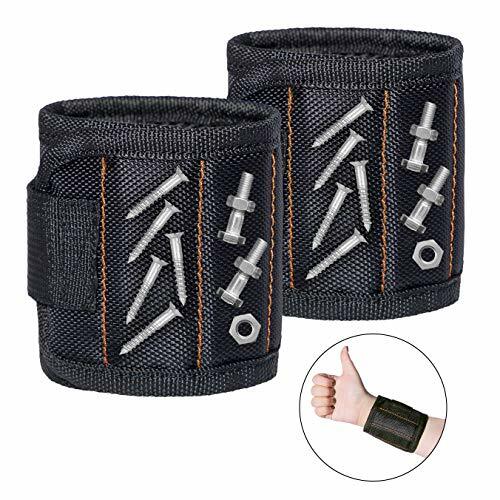 This magnet wrist screw holder suited for men and women.This powerful Magnetic Wristband is the right strength -- strong enough to hold small hardware without being SO strong that items would be hard to pull off.